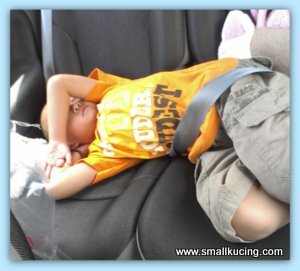 Check-out from then slept all the way from Ipoh to Bidor. Arrived Bidor nearly 3pm but surprisingly the famous Pun Chun Restaurant was still very full. Had to wait for quite a long time to get a table and quite a long time before food was served. Thought the food would not be fast but it took the drinks even longer to be served. 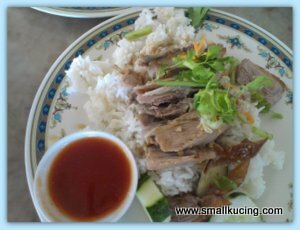 And Roast Duck Rice(RM4). No need to wait long as Mamarazzi ordered from the mixed rice stall. Taste pretty good. Generous portions of meat too for RM4. My Wanton Soup Noodle finally arrived. Sorry. Too hungry. Mamarazzi forgotten to snap photo while it was in its pristine condition. Walloped the whole bowl of noodles by my self while Papa helped me to finish off the Pork and Wanton. Looks like Mamarazzi was famished too coz she had forgotten to snap photo of her Duck Noodle too before eating. Taste wonderful as usual but was given the breast portion instead of the drumstick. At the time of writing this post, Mamarazzi found their website and discovered that they are giving breast portion of the duck instead of drumstick as there are shortage of duck. As we were turning out from the Pun Chun Restaurant, we saw several food hawker at the roadside. Decided to stop and buy something to much in the car. Cheap. RM1-50 a big piece like that. Refused to have my photo taken. 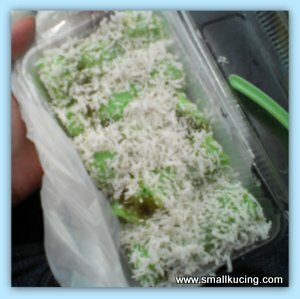 Very long time have not had Putu Bamboo. 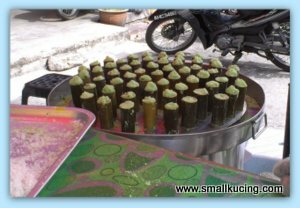 It's made of rice flour, cooked with palm sugar and desiccated coconut, steamed in bamboo pipes. Cute to see the rice flour rising while being steamed and the man pushing them back. After it's cooked, the roll would be taken out and roll on with the desiccated coconut. Papa had one piece. Did not finish. When we arrived home the coconut had become stale. Too bad. Coconut just cannot stand hot weather. Taste good too. 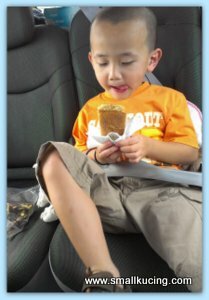 Eat till crossed leg leh.! wah, eat and eat and eat again!! now reading all blogs about food makes me so hungry already!! but then although feel like having something before going to bed, i must control myself.. or else getting rounder and rounder like doraemon already~~ hehe!! 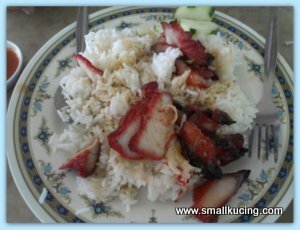 the char siew rice nice meh?? looks like quite bland like that woh.. but the wantan noodles looks good woh, the soup seems to be very flavorful leh..
putu bamboo or putu buluh?? haha.. have not tried this before leh, it looks good woh.. aiyah, should have opened the cover so that the coconut will not go stale mah.. wasted already the whole box..
Next time I can help you with the pork and the wanton, you eat the noodles, k? LOL!!! My sister loves the Wanton soup. Although I've not tasted it before, and I look forward for it. I can see you all had a really good time. 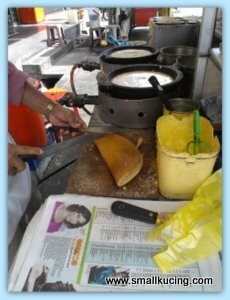 I love apam balik..my favorite! I just went there and I still got drumstick..
You didn't order the yam puff? Pun Chun...my all time favorite. 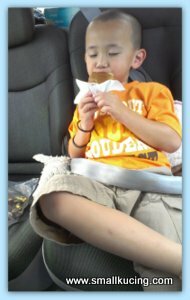 Did you buy the chicken biscuits? 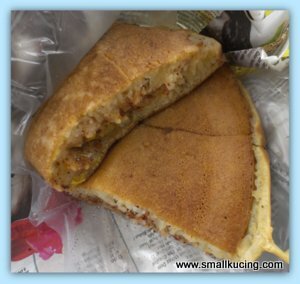 Apam Balik!!! My favourite. yums! is that a putu bamboo?? look's delicious.. yummy!! 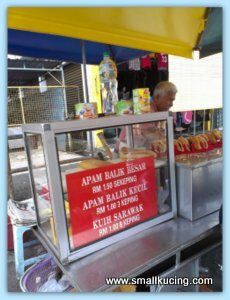 Pun Chun in Ara Damansara. No need go so far jor. 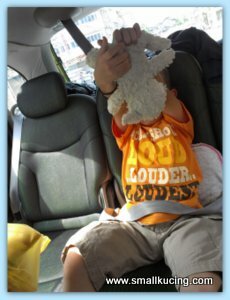 Small Kucing really has good time with Mamarazzi and Papa by eat eat eat all the way from Ipoh to Bidor. Hahaha..
Mamarazzi and paparazzi are so good in hunting food. The put bamboo looked good actually. One thing, Mamarazzi is so small size though having so much good food. Wah, that plate of BBQ rice, makes me so hungry now! I'm a fan of rice, if there is a "fan-thong" club, you bet I'll join it! Droolllinngg....again...so many nice food. 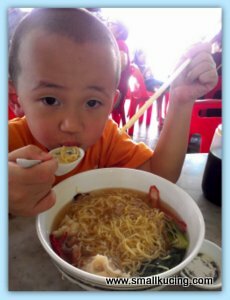 I like wanton mee! My fav being the duck rice and that is tempting me right now, can't wait for my dinner now. Like what Little Lamb said , now they have it at ara damansara. can explore that area. 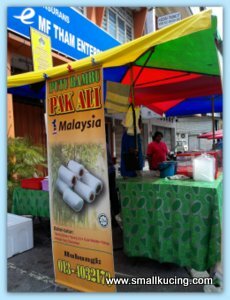 Putu Bamboo? Never heard and saw that kueh. Every single thing looks so delicious!! Now I am very hungry!! i thought the duck noodles was over-rated & over-priced, but the crowd doesn't seem to agree!! I haven't had putu bamboo for a long time too. Time to hit the stores. Hahaha! 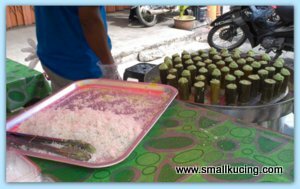 Putu bamboo is something similar with putu piring? 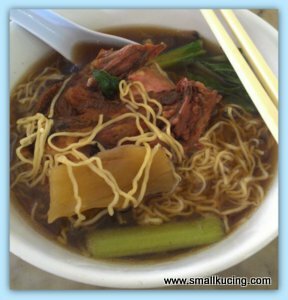 You don't have to travel all the way to Bidor for Pun Chun noodles. They have a branch in Ara Damansara and Kota Kemuning.